Boil the daal till soft and dry. Grind it well and keep it aside in mixing bowl. Add chopped dhania, onions, green chilies, salt and red chili powder. 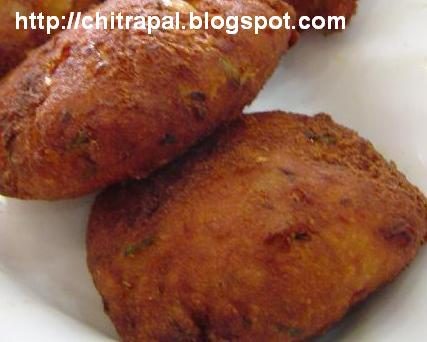 Form them in balls and then in desired cutlets shapes or cut them with help of cookie cutter. Dip each cutlet in egg and then roll them in bread crumbs sheet or tray. Set them aside for 5 minutes to set the bread crumbs. Now deep fry them and serve hot with tea or coffee. You can make them ahead of time and freeze them in air tight container and fry later. Thanks Mr Shah, You can always use ,melted butter instead of egg or spray oil just to coat bread crumbs.